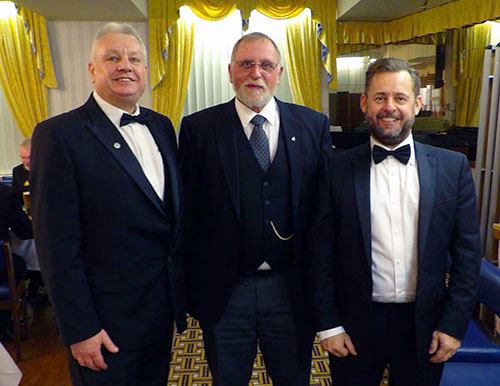 The refined lounge bar that serves the needs of the members of the Masonic Hall in Blackpool was brimming with kindly patrons awaiting the start of the installation meeting of Blackpool Lodge No 1476, one of the oldest and most eminent lodges on the Fylde coast. Pictured from left to right, are: William Atcheson, Stewart Seddon, Robert Arrand, Lee Martin and Christopher Hill. Noble Masons were in abundance. In the immediate vicinity of the bar stood the primary host, master of the lodge Lee Martin, quietly contemplating the imminent ceremony. Farther afield and drinking in the atmosphere was the principal guest of the day Assistant Provincial Grand Master Stewart Seddon, who was mingling with the masses and sharing the warmth of his geniality. Secretary of the lodge and acting director of ceremonies William Atcheson was darting hither and thither, finalising last minute details of the forthcoming event, in sharp contrast to the general relaxed and genteel mood of the gathered throng. Some sat in restful silence, each busy with his own thoughts, doubtlessly privately rehearsing his allotted ritual. All in all, it was a scene of tranquil expectation and calm confidence. After adequately fortifying themselves in preparation for the stern ordeal, they wended their way up the stairs to the lodge room to make battle. 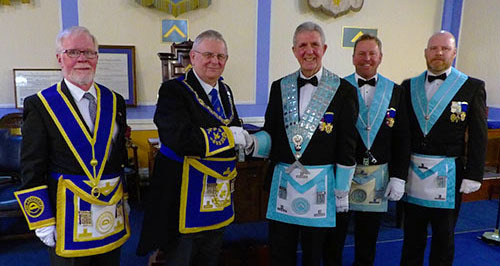 Following traditional format, Lee Martin opened the lodge and efficiently progressed through the general business and opening of the lodge in the second and third degrees in readiness for the procession of dignitaries. Lee Martin (right) points out the new master Robert Arrand. As is generally observed with a Stewart Seddon entry, he was accompanied by an entourage of acting Provincial grand officers from the Leyland and Chorley Groups, his zone of responsibility. These included Ian Smith, Derek Robinson, Andy Sumner and Gordon MacKay. In addition, Stewart was supported by grand officers Edward Rhodes, Giles Berkley, Keith Beardmore and Chairman of Blackpool Group John Turpin. Adding further dignity to the occasion were group vice chairman David Cook, group secretary Steve Jelly and stalwart of the lodge Robert McGown. Following the customary salutations to the worthies, and resumption in the second degree, master of the lodge Lee invited Robert McGown to undertake the responsibility of installing senior warden, Keith Beardmore to accept those of installing junior warden and master of Blackpool Lodge of Tranquillity No 6544 Anthony Ellis those of installing inner guard. Duly completed and settled in their places, master elect Robert Arrand was presented by his good friend Neil Webster in preparation for his obligation as master elect, a task that Robert performed with gusto and precision. There then occurred a delightful twist to a standard installation ceremony. Lee relinquished the master’s chair to Chris Hill, in order that he could conduct the ritual involved in the inner workings and placing of Robert into the chair of King Solomon. It was a charming variation to the norm, allowing more of Robert’s friends to be directly involved in the ceremony. Lee had done a fine job and Chris was not going to allow the standard to drop. He too performed his element of the ritual in perfect style before returning the role of installing master back to Lee, who judiciously completed the rest of the ceremony with splendour and panache. Pictured left to right, are: Glynn Manton, Brian Ogden and Darren Clemson. Mimicking the excellence established by Lee and Chris, the remaining members of the cast executed their elements of the ceremony to a similar degree of perfection. Whether the performer was a ‘light blue’ Mason, a Provincial grand officer or grand officer, all put their hearts and souls into their respective roles. None could exemplify such an aim better than those brethren who presented the working tools of the third, second and first degrees. Each had practised and practised until each word flowed effortlessly and precisely. Master Mason Glynn Manton gave a superb rendition of the third degree tools, followed by dedicated Provincial grand officer Brian Ogden who gave a brilliant performance in presenting the extended version of the second degree tools. And perhaps the most enthralling display of the evening came when fellow craft Freemason Darren Clemson belted out the first degree working tools with tremendous passion and deliberation. It would be difficult to overpraise the magnificent manner and firmness with which he spoke. Affairs took an even more pleasant turn during the investiture of lodge officers. 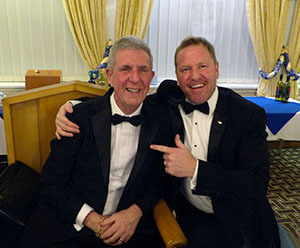 As one might expect from Masons of such experience as Robert McGown and Keith Beardmore, their respective addresses to the senior and junior wardens were impeccable and powerful but, then, both are absolutely men of chilled steel who can take on any role. Rising to the occasion, and not to be outdone, Anthony Ellis gave a faultless address to the new inner guard. Brian Ogden demonstrated his versatility by providing a sincere address to the immediate past master Lee Martin. Brilliance in the form of William Atcheson in his address to the new chaplain combined with emotion in Stan Hill’s address to his son Chris in accepting the role of lodge charity steward, followed by crisp efficiency and dedication from group charity steward Ian Stirling in his explanation of the charity steward’s responsibilities as Festival representative. Assistant director of ceremonies Rory Maskell did a fine job in directing the deacons on their duties, as did Ian Fowler in his strong address to the stewards. In the closing stages of the ceremony, Neil Webster stepped forth and delivered a sincere and passionate address to the newly-installed master and those present were, no doubt, moved by the quiet gravity of his tone. They were plainly impressed by his triumph. Similarly, Brendon Fenton left his mark on the proceedings with an inspired address to the wardens. Phil Bolton at the piano and John Darrell prepare for the master’s song. It only left Assistant Provincial Grand Master Stewart Seddon to address the brethren of the lodge. The way he delivered the whole piece seemed like one of those great epics you read about. It was taken meticulous step by meticulous step and the interest and drama steadily worked up to the final stirring moment. It was a masterful performance. The installation ceremony proper being completed, Stewart conveyed greetings from the Provincial Grand Master Tony Harrison, lavishing praise on all involved for the effort, determination and skill that had been put in to produce such an excellent and enjoyable ceremony. As is customary at that juncture, immediate past master Lee Martin presented Stewart with details of the lodge’s charitable disbursements, consisting of £400 to the Blackpool Masonic Hall Building Fund, £2,000 to the Masonic Charitable Foundation 2021 Festival (along with a further £85.50 from Gift Aid donations), £60 to the Blackpool Museum of Freemasonry and varying smaller sums to Masonic Clay Pigeon Shooting, Golf, Bowls and Fishing Societies. 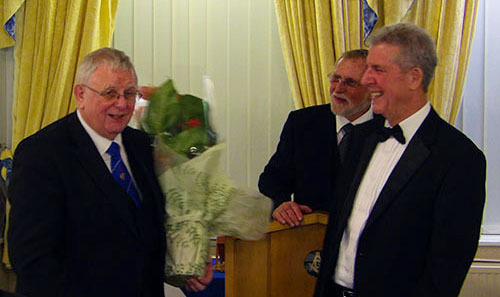 Stewart Seddon (left) receives a bouquet of flowers from Robert Arrand (right) while Brian Ogden ensures that the correct protocol is followed. Resulting from the donation of £2,000 to the Masonic Charitable Foundation 2021 Festival and in recognition of the lodge’s achievement, Provincial Charity Steward Ted Rhodes was delighted to present the newly-installed master with a Festival Vice Patronage certificate. 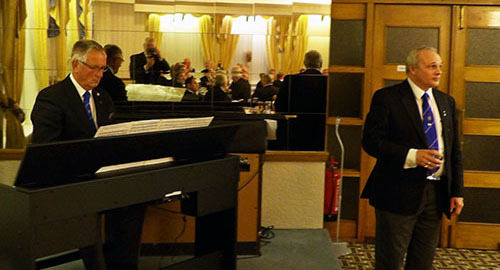 At the festive board that followed the conclusion of the installation ceremony, Stewart, in his response to the toast to the grand officers, was again highly enthusiastic about the quality of the ceremony before drawing the company’s attention to a number of current issues that the Provincial Grand Master Tony Harrison wishes to emphasise, including the need to continue supporting the MCF 2021 Festival, the importance of our Masonic halls, and a recommendation to introduce the concept of Royal Arch Masonry to initiates in the Craft at an early stage of their joining the fraternity. The customary master’s song was superbly performed by John Darrell, while equally superbly accompanied on the piano by Phil Bolton. The day had been a great success. The installation ceremony had been magnificent. The festive board had been highly genial and enjoyable. The evening would be remembered in glorious style and those younger Masons who continue to strengthen the lodge by playing an active role in the rituals had done so with passion, panache and sheer brilliance. Blackpool Lodge will surely be firmly positioned in the premier league of installation ceremonies. Pictured from left to right, are: Gordon MacKay, Derek Robinson, Keith Beardmore, Steve Jelly, Giles Berkley, David Cook, Ted Rhodes, Stewart Seddon, Robert Arrand, Lee Martin, Chris Hill, John Turpin, Robert McGown, Ian Smith and Andy Sumner.